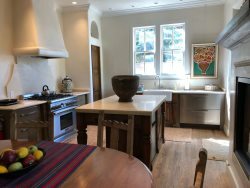 This historical Santa Fe Adobe offers an organic stay in downtown Santa Fe near the Plaza – Canyon Road area. This organic architecture is designed to thrill and excite visitors who want a True Santa Fe experience. Designed by Phil Hawes (Frank Lloyd Wright) Taliesin West campus and also designed Biosphere Two in Arizona. His use of natural and local building material along with an all woman crew makes for a unique stay. True Adobe is made with double handmade bricks, hand stripped pine vigas, brick floors and stone detailing in every room. A kiva fireplace in the living room and master bedroom. This organic architecture also has a beautiful large garden area, along with and Adobe enclosed garden area that has access from both bedrooms. There is parking for one at the front of the house, with additional parking on the upper level.